Treatments may involve using very fine needles (acupuncture), massaging special points on your body (acupressure) and herbal medicine. The acupuncture needles are very fine (0.16mm) and you usually only feel a small prick. I usually choose less than 4 points on the body and needles are left for less than 1 minute per point. Do the herbs taste yucky? I use herbal medicines that are specially designed for children. They are sweetened with stevia, a natural sweetener. You take a small spoonful in a little bit of water in the morning and at night. You can also add a little bit of honey if you like. A scientific review conducted in 2011 examined 37 peer-reviewed studies and found that the incidence of adverse events was 11%. Most of these adverse events were mild (bruising, discomfort, crying). The authors concluded that “based on available data, we are comfortable saying that in trained hands, paediatric acupuncture is safe”. My child is unsure about having needles. Can Chinese medicine still help? Yes. 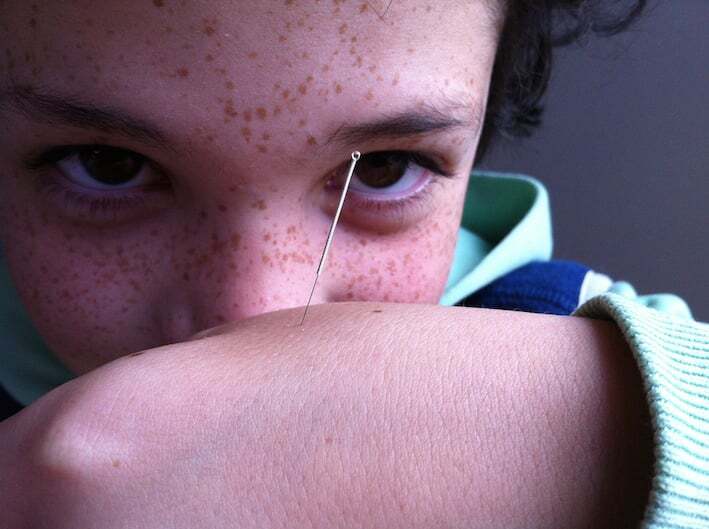 It can take a few visits for a child to feel confident in having acupuncture. I also use acupressure techniques and herbal medicines and these can be very effective by themselves. Simple dietary or lifestyles changes may also be important to support your child’s health. Treatment for skin conditions usually involves the application of herbal creams. How old does my child have to be to have acupuncture? A general guide is 7 or older, but younger children can be amenable to treatment depending on their personality. Treatments are usually 30 minutes and cost $45. A one week supply or herbs ranges from $10-$20 depending on the formula given.